Q – Sam, I live in NJ. My son, a junior at Cherry Hill West, has camp invites from as far away as San Diego State and Arizona State U, to Georgia State, Villanova, UConn Dartmouth, GPA camp (Yale coach) and UVirgnia (along with a dozen and a half more). These invites have come via email and regular mail, some with the coach writing on the outside of the envelope to please attend. When we dont go, another camp date follows. I dont have enough money or time off to get to these and i was wondering just how important it is that he attend them, considering he is only in his junior year. Would my money be better spent waiting for this summer and then, should I put my limited funds towards him playing at one of the travel teams he’s been invited to play for, like East Cobb, Farrah Builders, Philadelphia Senators, Go Yard, Tri State Arsenal, or going to showcases and/or the college camps and playing locally with Burlington in the RVL age unlimited league? My son is in a panic that he will miss the recruiting boat if he does not get to these events NOW. Thanks. – Ed T.
A – Ed, I certainly understand how you feel at this point but don’t panic. Nobody has the resources to send their kids to that many camps. My first thought is that these camps are targeted for college recruitment. That being said, talk to your son and find out the general area where your son would go to school to play. Once I had that info I would pick out a camp near you so as not to get lost in the shuffle. I am assuming your son has aspirations of pro ball so playing in a good summer league is the way to go. Major league scouts don’t miss too many kids out there. I sent my son to an instructional camp that helps to place kids like your son in colleges. I didn’t think much of it at first, but in the end I thought it was a great way to go. They rank the kids on their level of play and help to contact schools for you. If you can find one of those near you, I would suggest that. Doug Cinnella at Pro Baseball Instruction is the man to talk to. He knows about those things and probably can help your son himself. Either way, as much exposure as possible is always a good thing, but don’t panic. He still has two years left of HS and needs to play as much ball as he can. Hope this helps a little …… I am sure he will be fine. Q – Hey Sam, My son is in 6th grade and he pitches and plays first base/third base. He is probably the best pitcher his age but he is also a very good hitter. I’d like him to pitch but I don’t want him pigeon holed into a non-hitting role. What should I have him try out for? The team consists of 6-8th graders. Thanks. – Rich H.
A – Rich, That is a tough question to answer without having seen your son, but let’s give it a try. I am assuming he is the best pitcher on the team, and that means to me that he is blessed with a good arm. That being said, he should have multiple positions he could excel at. Almost all outfielders have pretty good arms so that is a start. If he likes catching ground balls then the infield ia another spot, more so at SS or 3rd base. Second and first a good arm is not a necessity. And lastly, catching would not be out of the question since most catchers have a good arm. Without seeing your son I would have you assess your sons skills at catching fly balls & ground balls , along with foot speed, and determine if he can run ’em down in the outfield or he is just first step quick and give him a try in the infield. Either way he sounds talented enough to play most positions and swing the bat. The most important thing is to play both in the field and at bat. He is too young not to be trying other positions and I would insist that he not be labeled at this young age. Anything can happen. 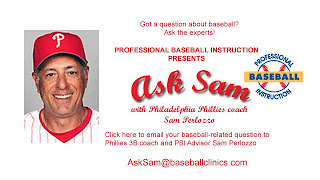 Q – Sam, good luck at first base for the Phillies next year. Glad to see you back with the Phils! How will your role with the team change next year being a coach at first base as opposed to being a third base coach, despite the obvious of choosing whether to hold or send runners from third? – Steve D.
A – Well Steve, I suppose the biggest difference will be the immediate impact of sending runners like you said. Other than that, I will assume the base running part of the game and will now have to make sure our guys are as good at running the bases and they can be. Most people equate base running with basestealing and that’s just not the whole case. For me, base running is a whole lot more than base stealing. Getting good leads, good breaks, making good turns are all as important for us to win a game than just stealing a base. That being said, I will now have to study films of opposing pitchers to see if I can pick up something that will allow us to steal a base. So that will be an addition. Even though I played mostly in the minor leagues, I did steal my share of bases.